Bella has discovered that rolling over can be fun! As of today, almost every time she is placed on the floor on her back, we return to find her either on her side or on her tummy. She struggles with the arm that is underneath of her, but she practices daily to master this. She often becomes quite frustrated when she can't get that darn arm out from underneath of her body. 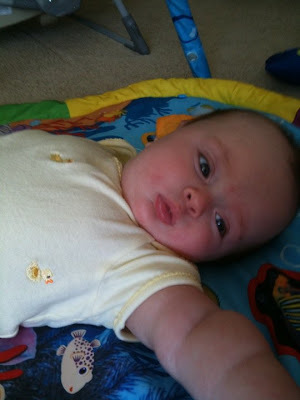 She still isn't a huge fan of tummy time, but she's doing much better with being on her tummy throughout the day.